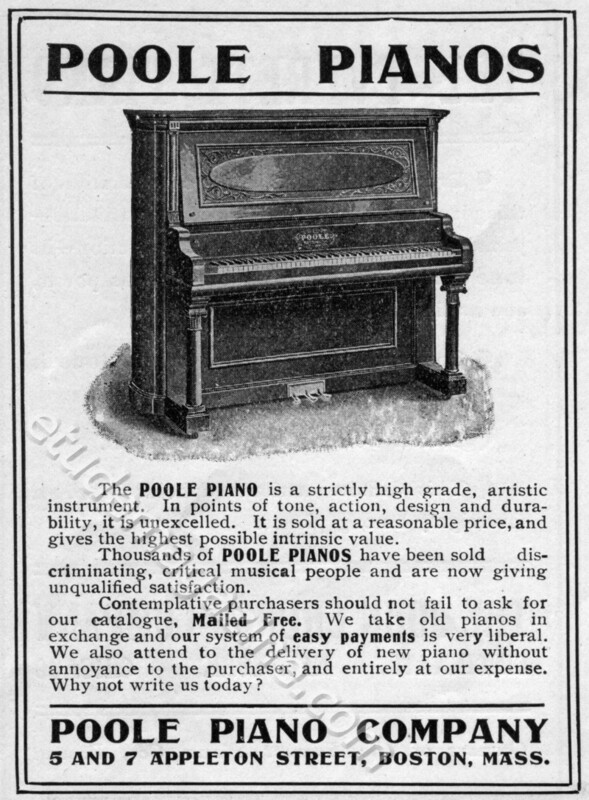 The POOLE PIANO is a strictly high grade, artistic instrument. In points of tone, action, design and durability, it is unexcelled. It is sold at a reasonable price, and gives the highest possible intrinsic value. Thousands of POOLE PIANOS have been sold discriminating, critical musical people and are now giving unqualified satisfaction. Contemplative purchasers should not fail to ask for our catalogue, Mailed Free. We take old pianos in exchange and our system of easy payments is very liberal. We also attend to the delivery of new piano without annoyance to the purchaser, and entirely at our expense. Why not write us today? 5 AND 7 APPLETON STREET, BOSTON, MASS.